Pakistani military officers were involved in the attack on the Indian Consulate in Mazar-e-Sharif in which assailants attempted to storm the mission building, a senior Afghan police official said on Tuesday. "We saw with our own eyes and I can say 99 per cent that those attackers were from Pakistani military and used special tactics while conducting their operation," Sayed Kamal Sadat, police chief of the Balkh province, said of the attack that took place last week. Sadat said the attackers -- officers from across the border -- were well-trained military men who fought Afghan security forces in the 25-hour siege. "The attackers were military personnel. They were educated and well prepared and had intelligence. They fought us and only by Allah's grace were we able to control them and eliminate them," Sadat was quoted as saying by Tolo News. The police official said efforts were underway to track down, identify and detain those who assisted the attackers to gain access to the building that was opposite the Indian Consulate. "We are jointly working with the NDS director and have spoken about this –- especially as they came here not able to speak in Dari or Pashtu but speaking in Urdu. It means obviously there is someone who guided those attackers and helped the attackers," Sadat said. 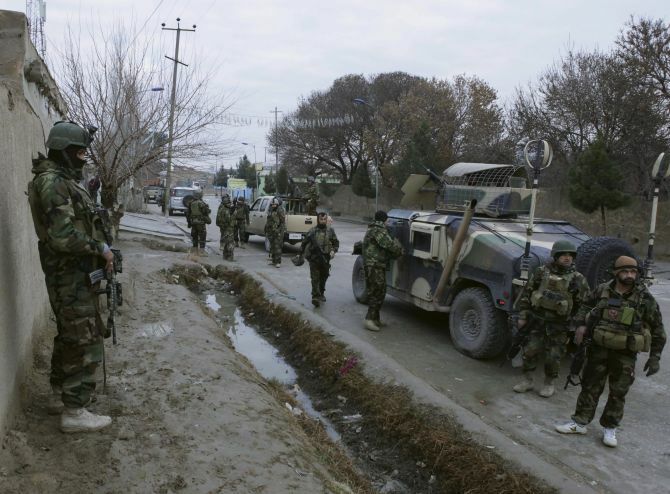 An intense gun-battle between security forces and the attackers took place outside the Indian Consulate in Mazar-e-Sharif after assailants attempted to storm the mission building on January 3. The standoff ended on the night of January 4 after the attackers who entered the building opposite the Indian Consulate were killed. One police solider also lost his life and nine others including three civilians were wounded in the incident. As the Consulate came under attack, Indo-Tibetan Border Police guards deployed on the sentry post foiled their attempt by raining heavy fire on them. A strong contingent of over four-dozen ITBP commandos has been securing this facility from 2008 apart from three other missions in the country and the main Embassy in the capital, Kabul. The security of these sensitive facilities was recently heightened after the ITBP deployed over 35 commandos at Indian missions in Kabul, Jalalabad, Herat, Kandhar and Mazar-e-Sharif.